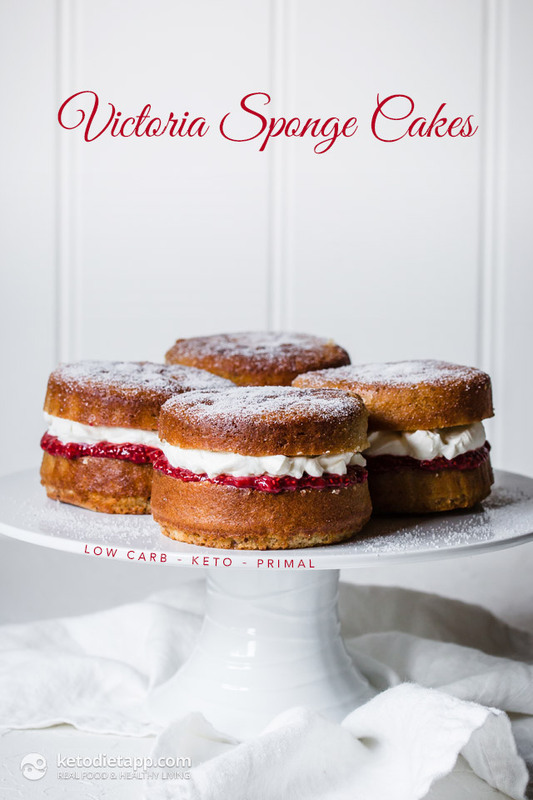 How pretty are these individual keto Victoria Sponges? 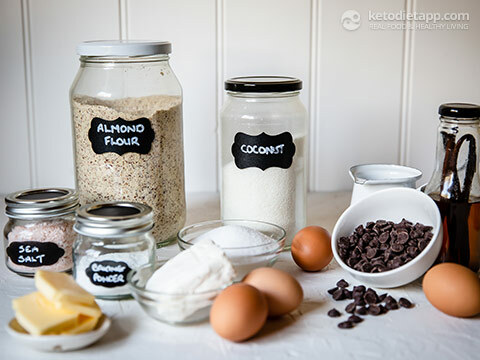 Such a lovely addition to a fancy afternoon tea or even a dinner party keto dessert. 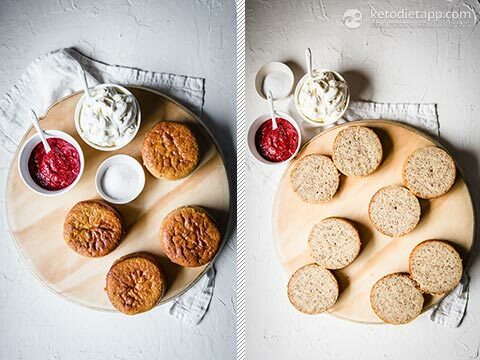 The vanilla cake used as a base for these cakes is one of my very favourite low-carb treats. Soft, moist and very vanilla-y, it’s delicious. Add a luscious layer of my Raspberry Balsamic Chia Jam or any other sugar-free chia jam and some whipped cream and you have an official slice of heaven. Enjoy! Pre-heat oven to 175 °C/ 350 °F. 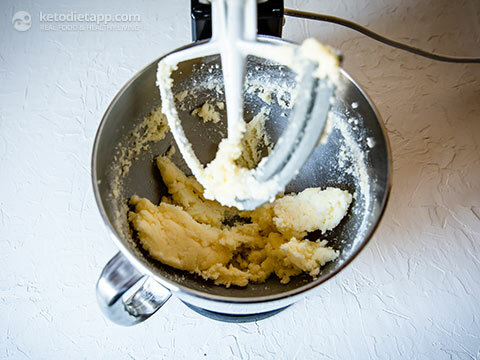 Using a stand mixer, beat the Swerve with the room temperature, softened butter, until fluffy. Add room temperature, softened cream cheese and beat until combined. With the mixer on low, add the eggs one at a time, beating well in between each egg. Add vanilla. In a bowl, place almond flour, baking powder and salt. 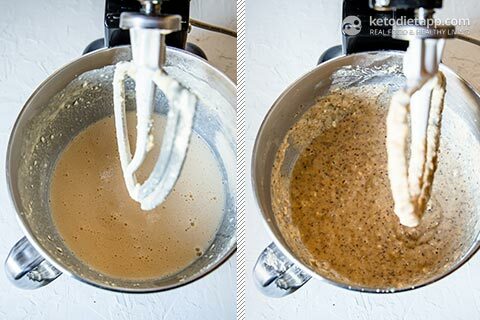 Add the dry ingredients into mixture and beat until combined. Grease and line one large (20-22 cm/ 9 inch) or six individual (11 cm/ 4.5 inch) springform pans. Pour batter into pans and bake for 45-60 minutes, checking the cakes(s) after 45 minutes of baking. 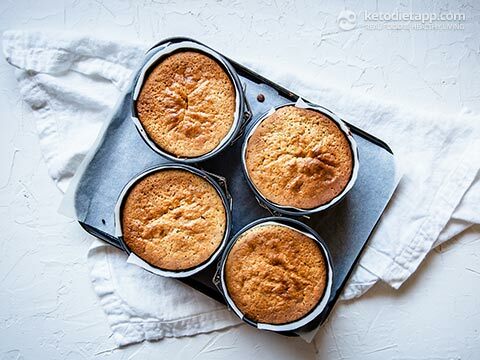 Small cakes will take less time to cook than one large cake. Once cool, remove from pan(s) and cut in half. Place cream and additional Swerve into bowl and whisk until firm whipped. Spread a layer of Raspberry Balsamic Jam on to one side of the cake (about 2 tbsp per sponge). 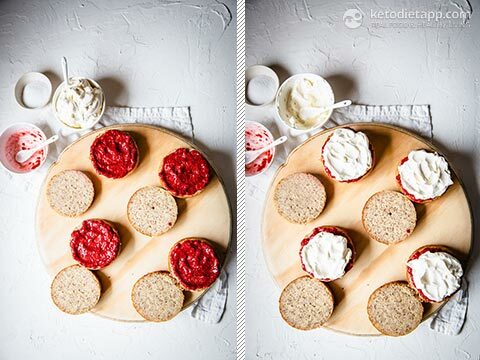 Spread a layer of whipped cream on the other side and sandwich together. Dust with powdered Swerve, if desired. Serve a slice (if making one cake), or half of the mini cake (if making 6 mini sponges). Store in the refrigerator, in a container, for 2 days. This is the best low carb cake recipe I've made, yet, plus it's super elegant. I recently made it one large cake split in half and filled with sugar-free strawberry and blueberry jam and whipped cream for a tea party and it was a total hit! I was actually sad I didn't have leftovers lol. Could you use this same recipe to make a type of jelly roll? Bake on a cookie sheet and then fill with a Keto whipped cream? Would it roll up properly? 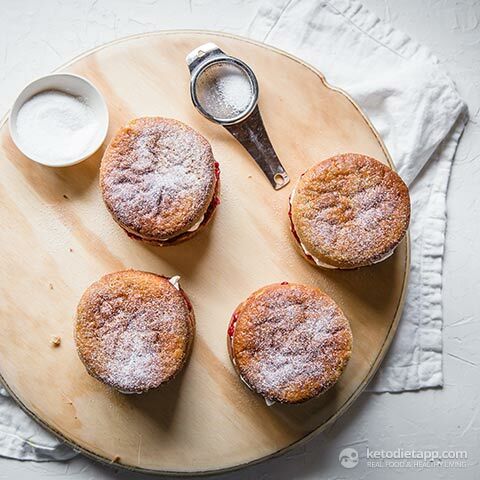 Photos indicate a victoria sponge with a top and bottom layer which seems to indicate that one whole sponge is one serving. 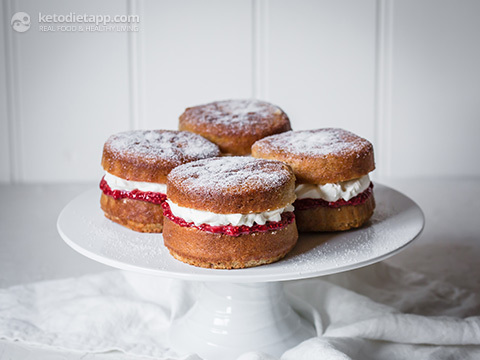 However, it says this serves 12, indicating you can only eat one half of the victoria sponge since there are only 6 spring forms. Hi Gina, that is correct. One serving is half of the cake. 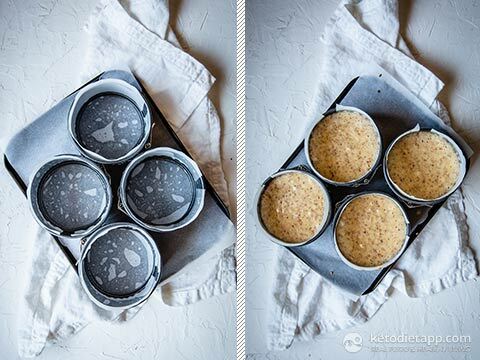 You could use smaller cake forms to make 12 sponges (1 serving- 1 cake). When it comes to the images, I think what happened is that Naomi used bigger cake forms and only made 4 larger Victoria sponges instead of 6. I'll clarify in the recipe - thank you! I also need to know the pan size please. Thanks for a great recipe. If making in single springform tin, what size do you recommend?